a peep-hole in a door or through a fishbowl. objects or scene into a circular shape. as a spyglass or monocle. 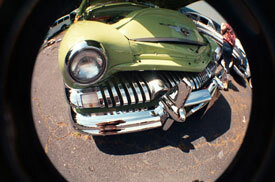 Have you heard the term “Lomography” yet? If not, I think you’re about to get excited. 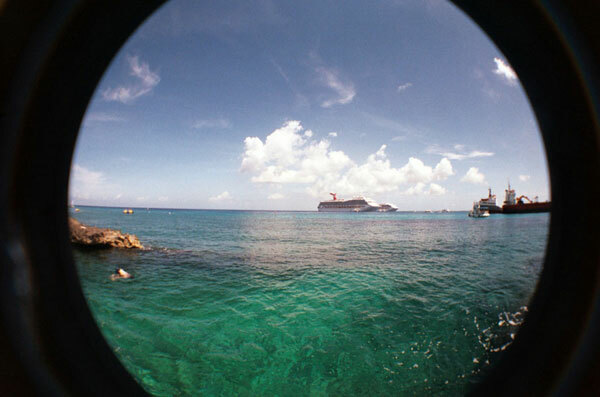 Lomography, or lomo, cameras are typically inexpensive, made of plastic with few controls, and require film. They produce an artistic snapshot that is unpredictable, experimental, and sometimes accidental. Characteristics of this type of photography also include blur, saturated colors, incongruous exposures, and a specific desired effect depending on the model of camera. 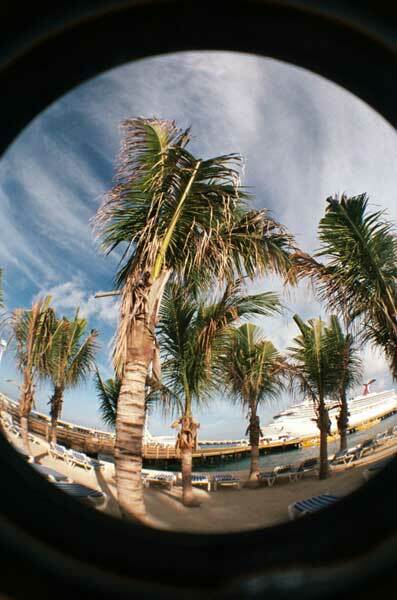 One of my favorites in the Lomo line is the fisheye camera. This is the only 35mm camera being produced anywhere with a built-in fisheye lens. It comes in multiple color options, is lightweight, and comes with a built-in flash. 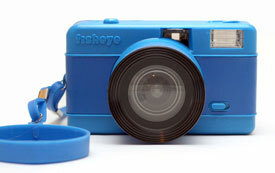 Prices range from $50-$80 at lomography.com. The fisheye lens offers between a 170-180 degree wide angle view which not only shows more in the frame than a typical lens or camera, but it also distorts the subject & begins to curve the lines within a circular shape. The closer the lens gets to the subject, the more distorted the image will be. The lens also incorporates a large depth of field to capture the foreground and background in focus. If you’re looking for something attention getting and fun or if you just want to let go of the control that the digital age has brought with it’s fancy technology, then one of these cameras is for you. They are easy to carry around, and at under $100, there’s little “worry” that you, the kids or dog may break it. One last bit of advice, if you do happen to venture into the unknown with one of these charms: Watch out for creeping feet and the dangling lens cap, which find their way into shots because of the fisheye lens's super wide angle of capture. Jenn Alexander Fletcher, aka BlondeShot Creative, specializes in unconventional lifestyle photography and is based in Atlanta, GA. You can find a sampling of Fletcher’s work on her blog: www.blondeshotcreative.blogspot.com. She has been exhibited and published nationally, both for her photography work and writing. Fletcher is also a camera equipment technician & blogger for KEH. “Lemography”....you really can learn something new everyday. Fascinating. Great article, and thanks for the tip about feet and lense caps. Love the spyglass look from afar. This was a truly great and interresting article. I learned about a new kind of camera which looks like it would be fun to use and experiment with, and you don’t have to buy an expensive SRL lens and camera. Please include more of these information articles. Interesting article. The camera looks like a lot of fun to use. Might be a good way to introduce film photography to kids since the camera is so cheap and the packaging so colorful. Very interesting! I might have to try one some day. Oh! I love this! Good call- to watch out for feet or lens cap “photobombs”. I want one now! I bet they take great dog pics. Great article! I think I’ma have to go fetch me one of those cameras. They look like a lot of fun! I’m a huge fan of the fisheye—I work for a photo studio that uses it for a lot of signature images. It’s great for getting shots of an entire room, too. Love Blondeshot’s work! !